It’s been quite been quite some time since I updated this site so I thought I’d report on what I’ve been up to. My first big news is that today is our 37th Wedding Anniversary! 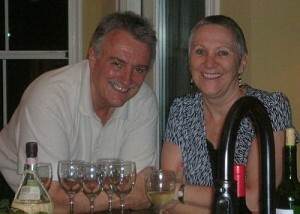 Happy Anniversary to my dear, sweet Robert, and here’s to MANY more! Okay, moving right along … My other big news is that I recently created a new website called tanglepatterns.com, and here’s how it all started. I’ve been a follower of the art form called Zentangle® and its originators Maria Thomas and Rick Roberts for some time, in fact I believe I subscribed to their first enewsletter which I’ve been enjoying regularly since December of 2005. But it was only quite recently that I received the official Zentangle Kit as a Christmas gift from my dear Mom. And I’ve become somewhat crazed ever since. In a Zen kind of way, of course. Zentangles are miniature pieces of black and white art that are not only exquisitely beautiful, they are fun and relaxing to create. The format is a 3 1/2-inch square “tile” of high quality paper (“fine, individually die-cut printmaking paper selected for its texture and archival characteristics”) on which one lightly pencils a border and a “string“, a freeform shape, into which one then draws intricate patterns, “tangles“, with a thin-nib archival ink Sakura Micron pen. The process of creating a Zentangle® is a form of “artistic meditation”, as you become completely engrossed in making each pattern focusing on “one stroke at a time”®. The creativity options and pattern combinations are boundless. And anyone can do it! A Zentangle has no up or down and is not a picture of something, so you have no worries about whether you can draw a hand, or a duck. You always succeed in creating a Zentangle. If you’ve never heard of Zentangle® before and would like to see some wonderful examples, check out the Zentangle Gallery to see originators Maria Thomas and Rick Roberts’ beautiful work. And visit the flickr stream for Belgian CZT® (Certified Zentangle Teacher) Jella Verelst. Jella teaches this art form as a form of meditation, which is as it should be. Her work is classic. One of my Type A personality traits is that I’m a chronic organizer and I love to create systems for everything. So when I received my Zentangle Kit, I soon set up a small squared Moleskine notebook system to track all the patterns I was learning and the steps to drawing them. I had already begun keeping records of the URLs of all the pattern instructions I could find online. One morning about a month ago, the thought struck me that my own personal “catalog” of patterns and the location of their instructions online might be useful to other Zentangle Zealots and Newbies. Thus was born tanglepatterns.com – an index and directory to tangle patterns online and how to draw them. The art form of the Zentangle® is gaining enthusiastic followers by leaps and bounds every day. I would like to think that tanglepatterns.com will become a great resource for many years to come. And I invite everyone who has a tangle pattern to share to submit it for inclusion to the site. I intend tanglepatterns.com to stick to the “Theory of Zentangle”. Thus, as long as your pattern “has no up or down and is not a picture of something”, it will be included. And that’s what I’m up to. For a long time to come. Only just read this, following a comment I was reading on a recent post. 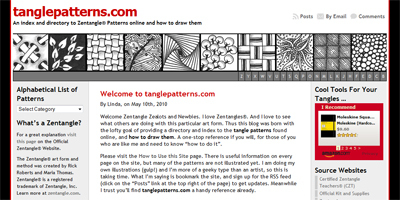 I have been connected to this site since the first day I was shown a Zentangle book and was told to just look up Tanglepatterns.com That was two years ago and I am just so grateful for your inspiration to even start such a site. It is so easy to navigate and is such a wonderful venue for sharing. It is where I send people when they discover what I am now so passionate about myself. I am a yoga teacher and even suggest it to some of my students who struggle with “taming” that “monkey mind” as we often call it. Hurray! Bought new computer at Christmas and had info transferred to new unit only to lose your info that I dearly appreciated and had subscribed to. That was Dec! !, today I was able to find you. Double hurray!!! Even had mailed note to you only to have it returned!!!. Now may I sell my own customized zentangle note paper? Hi Pat, so glad you tracked me down. Be sure to sign up again for the TanglePatterns emails! We just celebrated our 42nd – time flies! Hi Thank for the early reply. Will certainly send check for renewal.